Like most people, I send and receive a lot of documents over email, and the vast majority of those are in PDF format. Over the last few months, I’ve been playing with the idea of moving all these documents into a single location and building an application to automatically index them. This would not only make it easier to find a specific one quickly, but also simplify backing things ups. Fast forward to last week, and I was reading about some of the Watson services in IBM Bluemix. 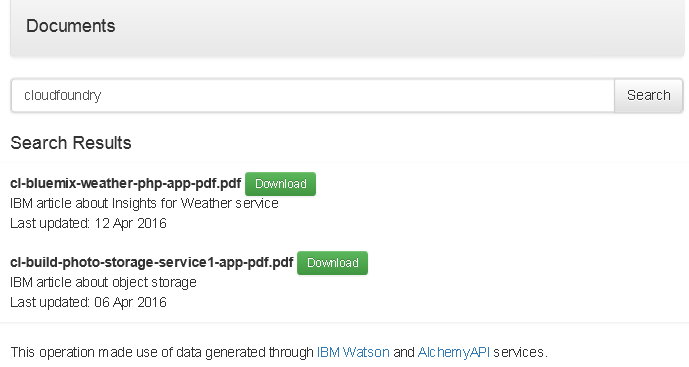 It occurred to me that it would be fairly easy to combine the Watson Document Conversion service with the AlchemyAPI Keyword Extraction service to automatically turn PDFs into text and then extract keywords from them. I could store the keywords in a database and wrap a search interface around it to create a fairly neat little PDF storage/search application. As it turned out, it worked exactly as I’d thought it would. A few hours of coding and I had the skeleton of a working application. A few more hours to hook it up with a couple of data stores (MongoDB for the keywords, a Swift object store for the actual PDFs) and add a pretty GUI, and my application was live on Bluemix. The final version lets users select and upload PDF documents from their computer. As each document is uploaded, it is automatically and intelligently scanned for keywords and those keywords are extracted and stored in a database. 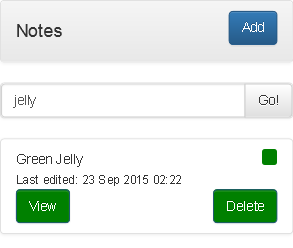 Users can later search by keyword to quickly identify and download documents relevant to their needs. Needless to say, it’s all mobile-optimized, so you can get to your documents from both your smartphone and your desktop computer. Try the prototype out, or fork the code on Github. If you’re interested in finding out more, read my developerWorks article, which walks you through all the technical details. I’ve been looking for an excuse to play with MongoLab’s DBaaS for a while…so when I had to choose a database for my latest IBM Bluemix application, MongoDB was first on my list. I like the idea of a document-oriented database as an alternative to the traditional RDBMS, and I was keen to try this in a real-world context. As it turned out, MongoDB’s document-oriented structure was a great fit for my idea of a fast, searchable, color-coded notepad in the cloud. Each “note” is modeled as a document in a MongoDB collection, and full-text searches across the documents in the collection are extremely efficient. 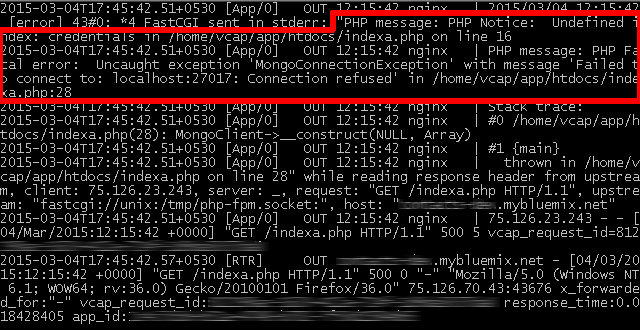 Thanks to MongoLab’s browser-based management, it was also very easy to configure and connect the MongoDB database to the PHP application running on Bluemix. The end result is a low-overhead mobile Web application that lets you store, categorize and search free-form text notes in the cloud. Check it out on Github, or read more in this IBM developerWorks article. For many people, the Internet of Things is…well, the Next Big Thing. It’s all about using the cloud, real-time data, and new sensor technology to collect, store and analyze information from a wide range of previously-unwired sources: your house, your car, your refrigerator, your pet and so on. While IoT is certainly very exciting, it’s hard to figure out exactly how to get started building IoT applications…especially if you’re a Web developer without a background in electrical engineering (like me). So I decided to invest a few weekends in learning about IoT and seeing if I could actually get a working IoT application up and running in PHP. That’s where the Internet of Things Foundation (IoTF) service came in. A hosted cloud service that’s available through IBM Bluemix, IoTF makes it super-easy to aggregate real-time streams for devices and do something useful with them. After a little bit of research, I was able to successfully use it to retrieve GPS coordinates from my Android smartphone and then combine that data with the Google Maps API (and a little bit of PHP glue) to plot my phone’s location on a map in real time. It’s a simple application, but it goes a long way towards demonstrating the potential of IoT applications…and it’s also given me the foundation I need to begin building more complex applications. If this sounds like something you’d like to get in on as well, take a look at my IBM developerWorks article about using IoT with PHP, and also has some code for you to get started with. Financial data is now more accessible than ever via open APIs. This makes it easy to build Web or mobile applications that let you track your investment portfolio on a minute-by-minute basis (or at least as often as you care to check it). That’s the idea behind my new portfolio tracking application, which lets you create a virtual portfolio of stocks and then shows you the current market value at any given point. How does it work? It’s mainly driven off the Quandl API, which is free to use and offers access to both open and premium financial databases. The Quandl API supports thousands of datasets, but I’m only using the free WIKI dataset, which is a community-curated list of end-of-day stock prices and dividends for 3,000 US companies. The application itself is written in PHP using the Silex micro-framework and uses a hosted Cloudant instance for data storage. jQuery Mobile ensures that the interface works well on smartphones, and the entire thing is hosted on Bluemix for maximum scalability. There’s also a little bit of HybridAuth in the mix, just so that every user can create his or her own account in the system using existing Google credentials. Sounds interesting? Try a demo, check out the source code on Github, or read about how I developed it in this two-part IBM developerWorks article. Cloud storage is increasingly popular because it’s cheap and scalable. Amazon Simple Storage Service (Amazon S3) is probably the most well-known, but almost every serious cloud vendor now has a storage offering. Cue my research into IBM Bluemix and its Object Storage service, which lets you attach cloud storage to your Bluemix application. Bluemix’s Object Storage service is based on OpenStack Swift and follows Swift’s three-tier hierarchy for organizing data: accounts, containers and objects. To try it out, I built a photo storage application hosted on Bluemix and integrated it with the Bluemix Object Storage service. With a little help from the IBM jStart PHP client library, it was easy enough to implement single-user photo upload and storage. And because Bluemix’s Object Storage service supports multiple sub-accounts per service instance, it wasn’t too hard to extend the base application to support multiple users and multiple containers per user. The final application uses Bootstrap for the user interface, Silex for application flow control, Twig for page templates and HybridAuth for user authentication. You can read the complete article here, get the source code from Github, or try out a live demo. I’ve been using IBM Cloud (aka IBM Bluemix) for various projects, but one of the things that often frustrates me is the lack of debug information available. 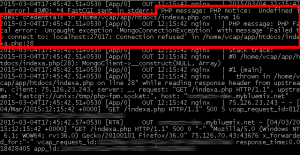 For example, it’s quite common to upload a new PHP application to IBM Cloud and then see a blank page when attempting to access it. The typical reason for this is that there’s a script error somewhere but the buildpack is configured to hide errors. Normally, the server error logs would let you figure out which script was causing the problem but since IBM Cloud is a PaaS, there’s no server console to log in to and tail log file output. As the image below illustrates, this usually has enough information to help you locate the source of the error, fix it and push a revised build to IBM Cloud. Google makes a number of APIs available for free – I’ve previously written about the Google Tasks API and the Google+ API. I recently came across another interesting one – the Google Places API. As the name suggests, the Google Places API lets you retrieve information about shops, businesses, and other establishments by location or keyword. The information returned by the API is quite detailed – it includes place names, place types, coordinates, addresses, opening hours, all coupled with a unique place ID. 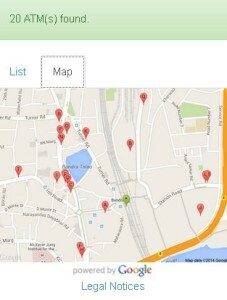 While experimenting with it, I thought of one useful application: finding the nearest ATM at any given location. It turned out to be reasonably easy to build, and things for even more interesting when I mashed up the ATM coordinates returned by the Google Places API with a map from the Google Maps API. The end result: a neat little mobile application that uses your current location to find a list of nearby ATMs, then shows you where they are on a map. This mobile ATM finder is now live on IBM Bluemix. Try it for free from your smartphone, read about how I built it or download the code to see what makes it tick. If you’re a developer used to developing and testing applications locally, moving your code to the cloud can be a bit daunting. First, you have to choose a cloud from the numerous options availabe. Then, you need to deal with the nitty-gritties of pricing, provisioning, application deployment, scalability and security. And finally, you need to keep track of server performance, debug application issues and find ways to cost-efficiently improve performance. Wish you had someone to hold your hand through the process? Read my detailed Apache Friends tutorials, which walk you through the process of hosting a PHP application in the cloud with Bitnami. In these tutorials, I describe how to use the Bitnami LAMP Stack to simply and efficiently create and provision a cloud server, then transfer your PHP application to it and monitor its performance. Take a look…you’ll be surprised by how easy it actually is! I first came across PHPCR through my work with Magnolia CMS, an open source Java CMS. Magnolia CMS uses the Java Content Repository (JSR-283) as its content storage mechanism and PHPCR is a PHP adaptation of that standard. It’s great for storing semi-structured content in a hierarchical format and it also includes support for content versioning and indexing. The cool thing about PHPCR is that it lets PHP developers interact with content stored in a JCR-compliant content repository using PHP objects and APIs…no Java knowledge needed. This means that you could save data to a JCR repository using a Java application, then read or modify that data using PHP, simplifying data reuse and interoperability between applications running on different platforms. Read more in my tutorial on integrating PHP applications with Magnolia CMS. It discusses a number of common use cases, including reading and writing content to a JCR repository and integrating a PHP front-end with a Java application via the JCR. The Nutritionix API is an online API which lets you access a massive database of nutrition information, covering both generic and branded food items. I came across it recently when looking for something else, and was promptly diverted from my original goal into trying it out. While playing with it, it occurred to me that this could be the basis of a very neat little application to track calorie consumption. Ideally, it needed to work on a mobile device so that it would be at hand at meal-times, and be simple, interactive and easy to use. After a little thought, I had my requirements and design down, so I went ahead and built it. 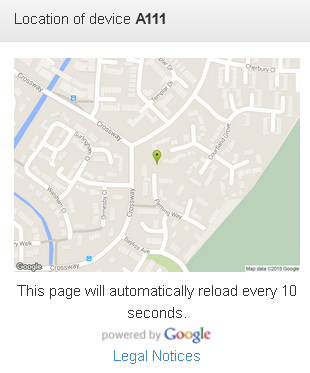 For the user interface, I used jQuery Mobile and AngularJS (something I’ve been itching to play with for a while). On the server, I used Slim, a PHP micro-framework, to connect with the Nutritionix API. The application is deployed on IBM Bluemix, which is also responsible for providing a MySQL service instance for account and meal record storage. Although I’ve used the PHP/MySQL combination on IBM Bluemix before, this application gave me an opportunity to try something new: email send-outs. If you’re developing locally, or on a system you have administrative privileges for, it’s easy enough to configure a mail server to handle outgoing email traffic, then use PHP’s mail() function to do the deed. On a PaaS service, this isn’t quite as easy…but Bluemix’s SendGrid service provides a viable solution if you’re willing to experiment a bit. For the full story, read my IBM developerWorks article…and then, don’t forget to try the demo app.